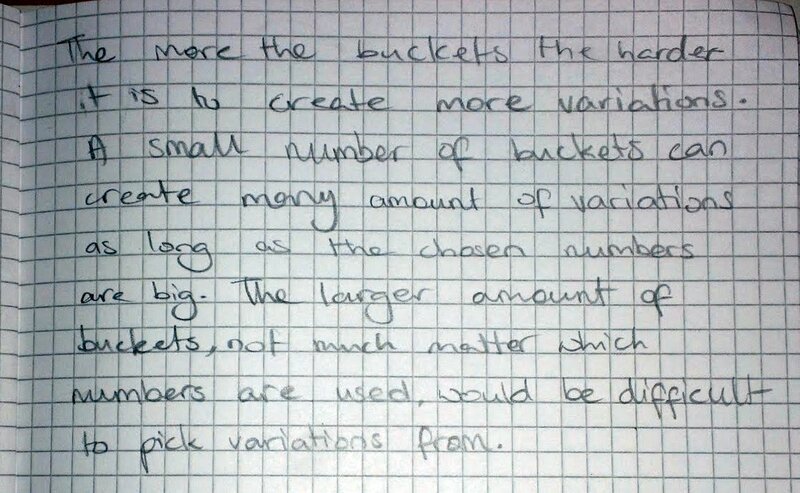 Today my S2 class spent a lesson doing some mathematical thinking. 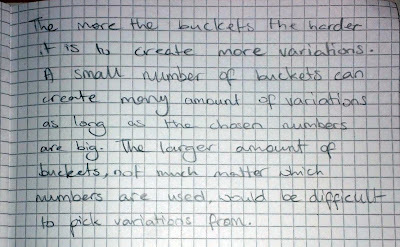 The prompt for this was an Nrich task, More and More Buckets. 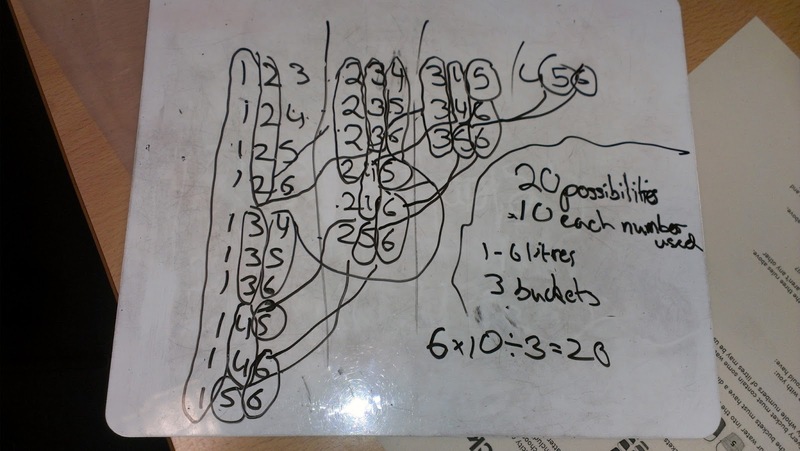 They are a high level set class, and this particular problem would not have been appropriate for all classes, but there are Nrich tasks to suit all ages and levels of prior learning. This group were trying to find a formula. 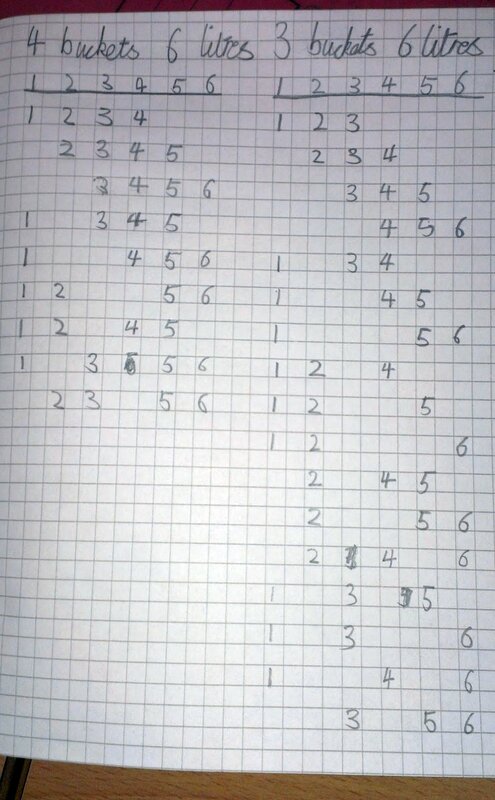 They laid out possibilities in an organised list, and spotted some interesting patterns. This group took a more qualitative approach - they did very well to analyse the problem sufficiently to reach this simple summary. 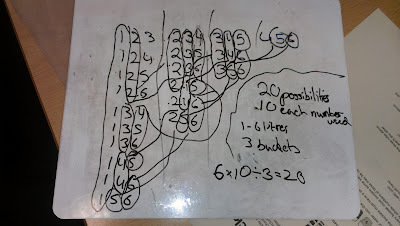 This group decided that it was helpful to think about the numbers that were missing each time, and this layout (which they invented) emphasises that. As always, I was delighted today by the way they responded to the task. The room was buzzing with animated discussions and arguments, all about the task. They filled show-me-boards and jotters with diagrams and explanations of their thinking, and approached the task in a wide variety of ways. These young people were completely absorbed in the open-ended exploration of the mathematics of a patently unrealistic and pointless situation. We, the human race, were only able to develop the concept of number (and all the mathematics which followed) because we are inclined to seek out and explore patterns. This is an innate, natural inclination, and it is my experience that young people take great pleasure in undertaking this mathematical thinking for its own sake, given the opportunity and appropriate prompts.